I know cotton candy has re-entered the scene recently and is all over the blogosphere but, not to sound like a hipster or anything, I swear I’m its most devoted/long-standing fan. Ask anyone who knows me, my two favorite flavors are bubble gum and cotton candy (ok theres three, I also love cake batter. Wait. And BBQ sauce. But that doesn’t really fit in with the theme of this post so…). I always chose cotton candy flavored anything when it’s available and its the first thing I head for at fairs and carnivals! I have never stopped loving you, cotton candy. But of course, you know that. 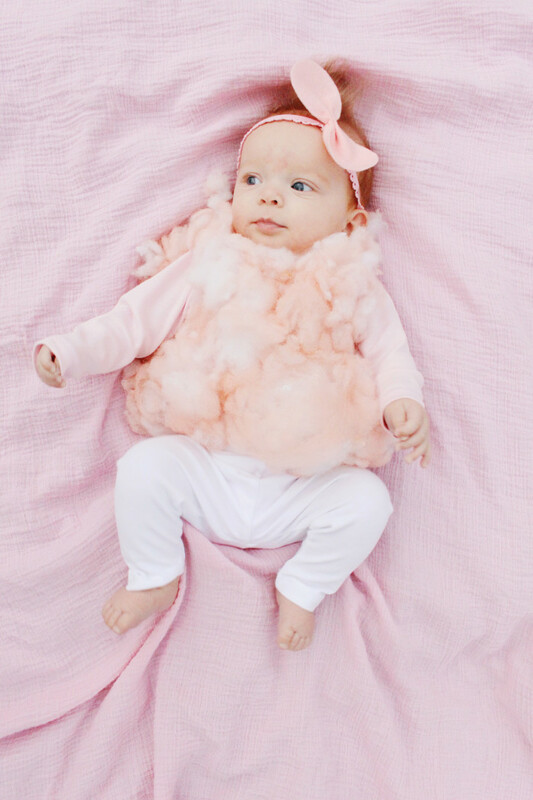 This year to pay my homage to the most delicious, and one of the most magical, candies to have ever been invented, I decided to dress my friend’s tiny baby up as a pink, fluffy cone of the sweet stuff! Ok. 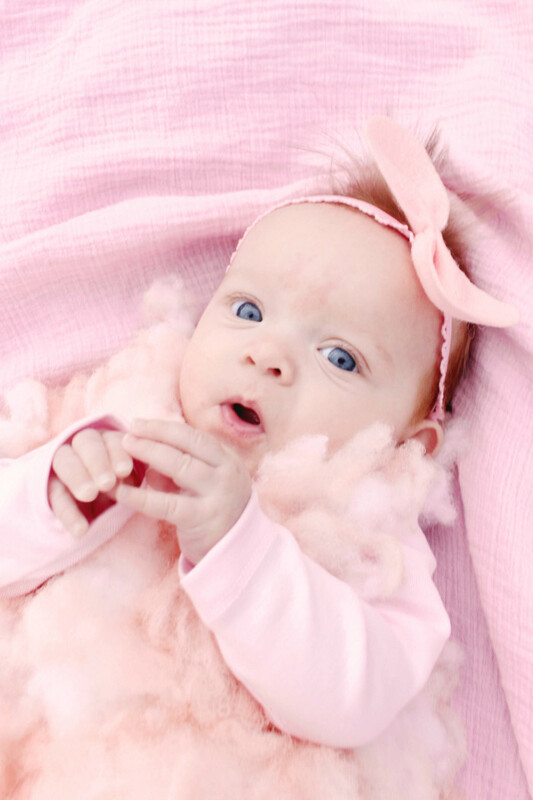 Nothing makes a cuter cotton candy than an itty bitty baby, am I right?! It’s almost a sweetness overload! Baby’s don’t care about being sort of goofy and in fluffy costumes so they’re the perfect fit for this suit although it could certainly be cute on a grown up! I’m just more personally into the simple adult costumes and letting the kids be wild! This costume only requires a few simple steps and its still comfy for baby so there shouldn’t be a fuss. Plus, we used long sleeves and leggings so it’s plenty warm. Feel free to layer underneath it as well if you need to. 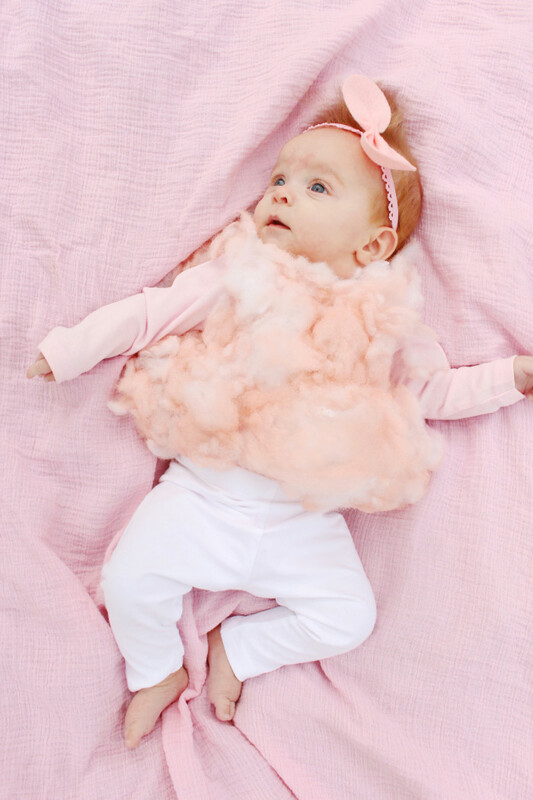 Even if you’re not dressing up a sweet lil babe, just look at this darling honey face! Are you kidding me?! 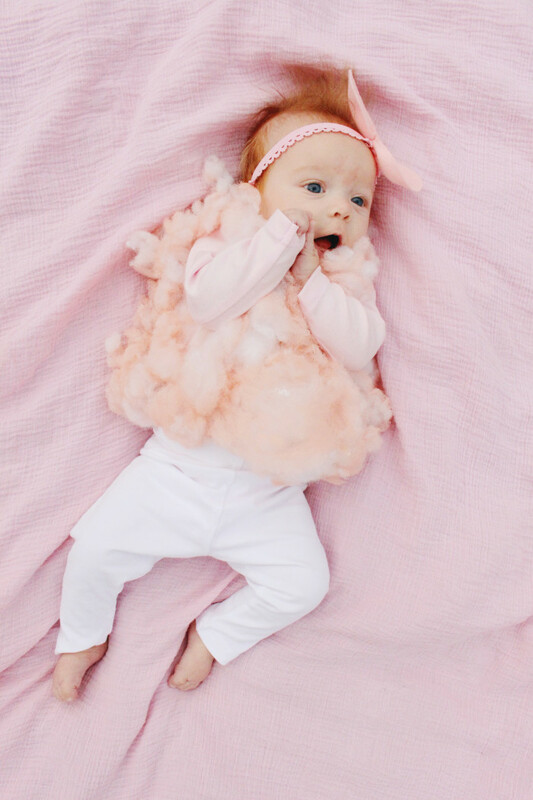 Click through to see more of this candy baby (and DIY instructions. But mostly, cute baby). We're twin sisters Malissa & Machelle. We love parties. We love design. We love to make things! We share fresh posts about those topics right here every Monday and Thursday!